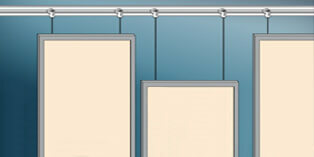 High quality wire cable display, sign and picture hanging systems. 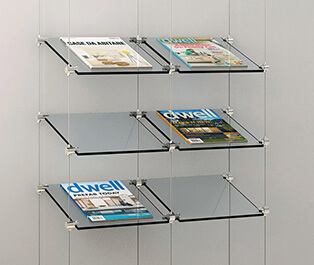 Innovative and fully expandable suspended displays offering incredible flexibility, so you can change shelving or layout configuration with ease. Cable display systems are ideal for the home, museums, art galleries, public buildings, corporate identity, or wherever visual communication is important. All display systems offer full range of mounting combinations: Floor to Ceiling, Floor to Wall, Ceiling to Wall, Wall to Wall and Ceiling Mount for Hanging Displays. Our display systems are suited to current trends in interior design, offering elegance and transparency for cable suspension systems in the home or workplace. Cable display supports and clamp accessories are designed to hold glass, acrylic and wooden shelving and display panels securely in place. Please Note: Cable display systems are designed for interior use only. All our cable display systems MUST only be used in conjunction with 7x7 construction stainless steel wire rope. Posilock cable display and wire hanging system is convenient and easy to assemble. The perfect display solution with an enormous range of fittings and components offering a multitude of combinations. Designed to be easily installed into a variety of surface conditions, including suspended ceilings. Posilock cable display system is available in two ranges: M8 for 1.5mm cable and M10 for 3mm cable. 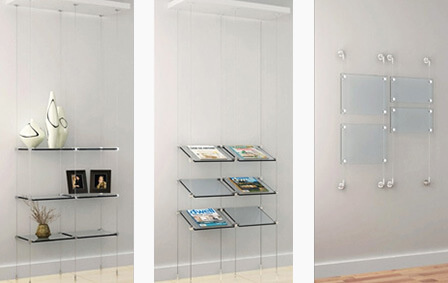 Create a stunning display every time with the Easy Fit Cable Display System. A simple yet incredibly versatile display system that is quick and easy to install. Ideal for suspended glass shelving and display panels with a choice of horizontal, vertical and adjustable angle shelf supports and clamps available. 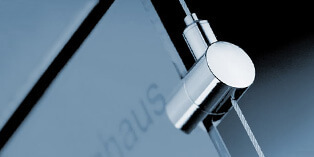 The 'Easy Fit' cable display system uses 2.5 mm Ø 7x7 stainless steel wire making it strong and long lasting. Cable display accessories are easy to position on tensioned wire and will support glass and panel thickness of 5 - 8mm. 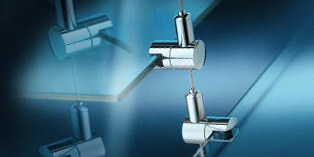 Floor, ceiling and wall mounted tensioner fittings are designed for direct fixing. Now available in easy to use kits, simply mix and match for your perfect display. See how Posilock components combine to create stunning displays. Fantastic range of hand held cutters for stainless steel wire rope. Gripple suspension systems designed for quick and easy installation.